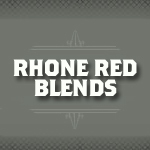 Red Rhone blends cover a rather wide swath of wines produced with grapes often found in France's Rhone Valley. But Red Rhone Blends can also be produced outside of France using combinations of these grapes. Varietals in these blends include Grenache, Syrah, & Mouvedre. The great balance between character and mellowness is the product of a bouquet of 2 grape varieties, Grenache and Syrah.